Wednesday rain cleared the air. By Thursday morning the clouds burned off in Halls Valley. We usually think of climbing Mt. Hamilton as one long grind to the observatory, an 18-mile celebration of breathtaking scenery, gears and lightweight equipment. But there’s a dark side to Mt. Hamilton, the eastern climb, which was not designed with horses and telescope equipment in mind. It’s a serious four-mile grind from Isabel Creek with the last half-mile the hardest at about 11 percent. Thursday I decided to leave from home and ride to The Junction, the only store between Livermore and San Jose, located at Del Puerto Canyon Road where Hwy 130 meets Mines Road. Then I rode back via Mt. Hamilton. The only downside is that the wildflowers were not yet ready to show themselves. I saw a sprinkling, but nothing to write home about. The good news is that from Mt. Hamilton summit the snow-capped Sierra stood out, which is always a sight to behold. Weather couldn’t have been nicer, with temperatures ranging from the low 50s to the low 70s by the end of the day. While at The Junction I joined another Ritchey Break Away owner for a mini convention of sorts. As it turned out he and his friends were also headed back my way, and we happened to leave at the same time. They had started at Halls Valley Lake in Grant Ranch park. As I started the last climb before the big one to the Mt. Hamilton summit I came across one of the riders I saw at the store. I stopped and asked what was up. He had a front flat, but not just any flat because he was riding those fancy tubeless tires. Now there’s a cautionary tale. I’ve never been a fan of tubeless tires. I asked if he had a spare tube and he said he did, but that it was a major hassle to install it. I don’t know the reasons, but from what I’ve read about tubeless tires, they’re not easy to mount and they rely on sealant to plug holes. He said he didn’t see any sealant coming out and couldn’t understand what was the problem. I couldn’t help, so I said I would ride ahead and let the other riders know his situation, which I did. I don’t know the outcome because I made it back to the park before they did. I do think airless tires have a future, just not the kind he was riding. The ones that look more promising, like Tannus, don’t rely on air pressure, just air gaps in rubber. However, the lowly tube and tire may remain the best, most reliable way to go until new materials come along. I can fix most anything that goes wrong with a tube/tire: blowouts, puncture vine, glass, etc. Another cautionary note about the backside of Mt. Hamilton. Your fancy smartphone won’t do much good because there isn’t any cell coverage. There isn’t much traffic either. At least most people driving by will be happy to help. This entry was posted on March 13, 2015 at 5:19 pm and is filed under Ride reports. You can follow any responses to this entry through the RSS 2.0 feed. You can leave a response, or trackback from your own site. I’m the other Ritchey rider. We were able to get 30 lbs of pressure in Nick’s front tire. He made it up the back side of Hamilton that way. We then were able to get 40 lbs of pressure in the front tire, and he descended slowly and Ray went to get his car to pick him up. That’s all of the story I know, but I assume all went well from there on. Thanks again for alerting us to Nick’s tire issue. We waited for him at the base of the climb and pooled our knowledge (Jim has had a great deal of experience using tubeless tires on his mountain bike, and knew how to manipulate the tire to get a better seal). 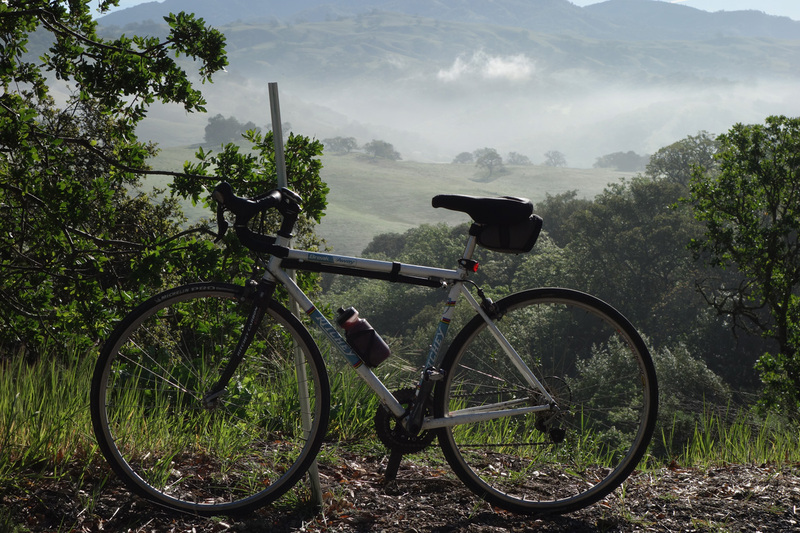 I was the rider with the flat tubeless tire, part of the Almaden Cycle Touring Club ride to the junction. I added some air and met my friends at the base of Mt. Hamilton. We sloshed the sealant around and added more air, and I climbed Mt. Hamilton with about 30 psi in my front tire. At the top of Mt. Ham we added more air and I descended slowly for about six miles until my carpool friend drove up to meet me. We never did find the cause of the problem, it just seemed like an air leak by the side of the rim. I replaced the tire, and we’ll see what happens next. I looked at my front brakes and noticed that one of the pads was high on the rim, pretty close to the tire edge. Perhaps the brake pad was rubbing on the tire, eventually causing the flat. The easiest way to fix a tubeless tire if you get a flat is to just put in a tube. That’s what I do with my mountain bike.